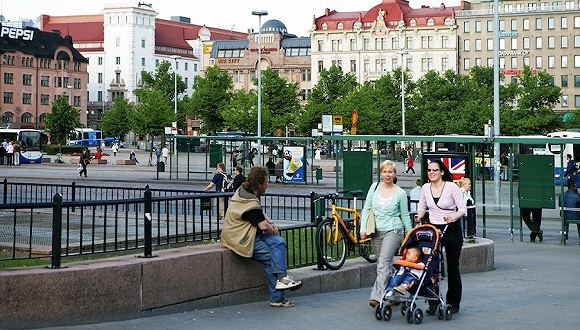 Finland is the world's happiest country. The World Happiness Report, published Wednesday, studied the happiness levels of 156 countries. It considered factors such as life expectancy, social support and corruption in its examination. Finland pushed last year's happiest country, Norway, to second place. The other three Nordic countries, Denmark, Sweden and Iceland also made the top ten. They are joined by Switzerland, The Netherlands, Canada, New Zealand, and Australia complete. The United States fell to 18th place. It came in 14th in the 2017 report. For the first time, the report also ranked 117 countries by the happiness and well-being of their foreign-born immigrants. Finland placed first in that group, as well. In fact, the study found that highly ranked countries in overall happiness had similarly happy immigrant populations. John Helliwell is an editor of the 2018 World Happiness Report. He said the study shows that a population's happiness seems contagious. In other words, it spreads. He called that the "most striking finding" of the report. "Those who move to happier countries gain, while those who move to less happy countries lose," Helliwell said. Finland is a nation of 5.5 million people. It has about 300,000 foreigners. Its largest immigrant groups come from other European countries. But there are also small communities from Afghanistan, China, Iraq and Somalia. Meik Wiking is chief of the Happiness Research Institute, based in Denmark's capital, Copenhagen. He said that Nordic countries almost always rank near the top of the happiness report. He said they are, in his word, "doing something right in terms of creating good conditions for good lives." He said the findings on the happiness of immigrants, "shows the conditions that we live under matter greatly to our quality of life, that happiness is not only a matter of choice." The United States ranked 11th in the first World Happiness report, released in 2012. It has never been in the top 10. The report noted several reasons for its falling position. It said the United States is in the middle of "a complex and worsening public health crisis, involving...obesity, opioid addiction and major depressive disorder." It added that the "sociopolitical system" in the U.S. produces more income inequality -- a major reason for unhappiness -- than other countries with similarly high-income levels. Relief of social pressure needs the assistance of social support system. Mexican and Korean voters are unhappy about income inequality and corruption. I hear she's going to sell out and move to the city. 5.He said they are, in his word, "doing something right in terms of creating good conditions for good lives." They have found that, in terms of both salary and career success, the sky is the limit. There is a convergence between capitalist firms and co-operatives in terms of business strategy. 6.For the first time, the report also ranked 117 countries by the happiness and well-being of their foreign-born immigrants. Streams had run dry for the first time in memory. For the first time in my career, I was failing.